Atlanta has been called the New York City of the south, but Atlanta residents prefer to think of it as something a little different, a city unique unto itself. Tradition reigns, which means there are dozens of annual events in Atlanta that need to be seen, visited, and explored. Whether you’re a longtime resident ready for a new adventure or someone looking to buy their first home in Atlanta, keep reading for some of the city’s top annual events. Billed as the largest New Year’s Eve celebration in the southeast, the Peach Drop is one of Atlanta’s favorite ways to spend the last night of the year. People come from all around the city and suburbs, as many as 100,000 in recent years. The Peach Drop has been around since 1989 and has only increased in popularity and size since. What began as a small event with only a few entertainers has grown to include national acts such as Collective Soul, Sister Hazel, Miranda Lambert, Julianne Hough, and many others. With the large number of restaurants, bars, and other spaces in Underground Atlanta, the party begins early and lasts until the wee hours of January 1. Contrary to popular belief, however, families are welcome. The day begins at 11:00am with children’s activities and entertainment, including live music, an arcade, and carnival rides. New Year’s Eve is a time to celebrate, and there is no better place to do so than in Underground Atlanta, watching the Peach Drop. For more than 80 years, the Atlanta Dogwood Festival has been the best way to welcome spring in the city. Walter Rich, founder of Rich’s department store, wanted to put Atlanta on the map because of the beautiful dogwood trees that bloom all over the city every spring. As a result, even more dogwood trees were planted, most of which can still be found today. Discontinued during World War II, the festival was reinstated in 1964 under the Women’s Chamber of Commerce and began to grow. By the early 90s, the Atlanta Dogwood Festival was a two-week long event, with Buckhead, Piedmont, and Midtown each playing host for the event. By the early 2000s, the Atlanta Dogwood Festival was moved to Piedmont Park, its current home, and has been growing in popularity and size each year since. 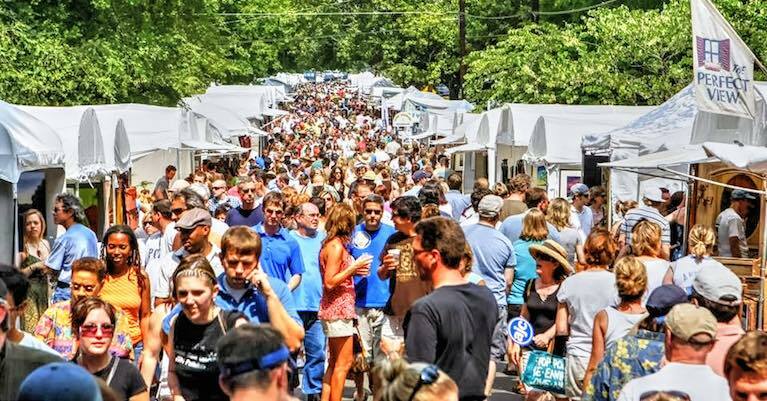 Visitors to the Atlanta Dogwood Festival can expect a variety of events, including live music, cook offs, a 5k, a family-friendly section with rides, games, and food, exhibitions, and, of course, the large artist market! 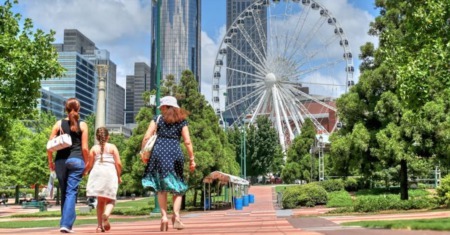 With the large variety of things to do, the Atlanta Dogwood Festival continues to be one of the most popular Atlanta events. Every July 4th since 1969, it’s been a tradition to wake up early, lace up the running shoes, and jog the 6.2 miles from Lenox Square Mall to Piedmont Park for the Peachtree Road Race. Organized by the Atlanta Track Club, the Peachtree Road Race is the largest 10K in the world and features around 60,000 runners of all levels. The Peachtree isn’t just a tradition for the runners, however. Families, couples, and individuals line the parade route, cheering and holding signs of encouragement and handing out water; rarely is the city brought together in such a way. The Peachtree Road Race also features a wheelchair race, a kid’s race, and an opportunity for joggers of all experience levels to join. 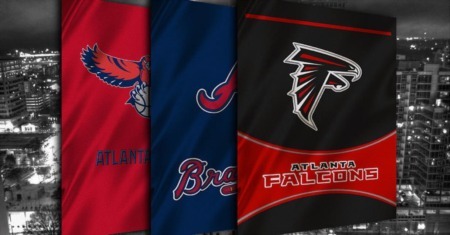 Each finisher, no matter their time, receives one of the coveted AJC Peachtree Road Race T-shirt, the design of which is an earnestly kept secret up until the day of the race. The Peachtree Road Race finishes at Piedmont Park, where food, live music, and free samples are provided to the participants and their friends and family. One of Atlanta’s best loved traditions, the Peachtree Road Race is the best way to welcome the Fourth of July in Atlanta. Don’t miss it. Every September, thousands of people descend upon downtown Atlanta for Dragon Con, the annual convention featuring hundreds of characters from books, television shows, movies, comic books, and more. For four days, hotels and streets spanning an entire city block are filled with more than 50,000 fans dressed up in elaborate costumes. The event offers fans an opportunity to connect with each other and experience everything the science fiction, fantasy and comic book world has to offer. The annual event boasts thousands of hours of programming including: a parade in the streets of Atlanta, autograph sessions, awards banquets, live performances, reading sessions, workshops, celebrity appearances, art shows, gaming sessions, tons of contests and even live wrestling. There is certainly no shortage of things to do and people to see, so purchase your tickets and reserve your hotel room early. This is an event any true fan of fantasy and gaming will not miss. During the first weekend of June, North Highland Avenue and Virginia Avenue close, booths appear, stages are built, and Summerfest welcomes the summer. For over 30 years, artists from all over the southeast have converged upon the small Midtown neighborhood, and attendees can enjoy a variety of art, homemade crafts, jewelry, garden pieces, and clothing. There is also two live music stages, a children’s area, and plenty of food vendors to complete the weekend. In recent years, a 5k road race opens the weekend with more than 1500 runners taking to the streets of Virginia-Highland. For the smaller attendees who enjoy running, the Tot Trot takes place after the 5k and is open to children under five years old. Some say summer isn’t complete without the Virginia-Highland Summerfest; it’s definitely an event that shouldn’t be missed. A tradition for many families for more than 40 years, the Yellow Daisy Festival brings more than 400 artists to the walking trails of Stone Mountain Park. Originally a small weekend event to celebrate the blooming of the Confederate Yellow Daisy, the festival has grown into a four day event with live music, dozens of food vendors, a children’s corner, and artists and crafters from over 38 states. Voted one of the top three arts & crafts shows in the nation, the Yellow Daisy Festival is a long tradition that continues to thrive. From 1994 until 2005, Music Midtown was the talk of the town. In 2011, when the music festival continued, the hype grew even bigger, and Music Midtown has grown into an event that, for music lovers, cannot be missed. Since its return, Music Midtown has featured national acts such as Red Hot Chili Peppers, Drivin N Cryin, Jack White, Eminem, and the Zac Brown Band, among many others. Originally taking place in the early summer months of May and June, Music Midtown has landed on a mid-September time frame, to prevent both the rainy summer weather and competing concerts. Music Midtown is a part of Atlanta history, and a great way to spend a September weekend. Don’t miss it. To some, Halloween is a big deal. They spend all year planning their costume, making sure every detail is just right. These folks (and their costumes) can usually be found at the Little 5 Points Halloween Festival & Parade. Voted one of the top 10 Halloween events in the country, the festival and parade are planned for and anticipated all year long. Over 35,000 people crowd the streets, either as onlookers or participants, and anything goes – from Colonel Sanders to the Ghostbusters, Power Rangers to princesses, the array and originality of the costumes is half the fun. Along with the parade, there is an artist market, food vendors, and live music, not to mention the numerous stores and restaurants that open their doors and welcome both the holiday and the visitors. If you’re looking for an interesting way to spend an October weekend, look no further than the Little 5 Points Halloween Festival and Parade. You won’t regret it.